Thanksgiving signals a series of intensive shopping days, so I hope all the birding and optics stores benefitted from the flurry of shopping last weekend and for weeks to come. 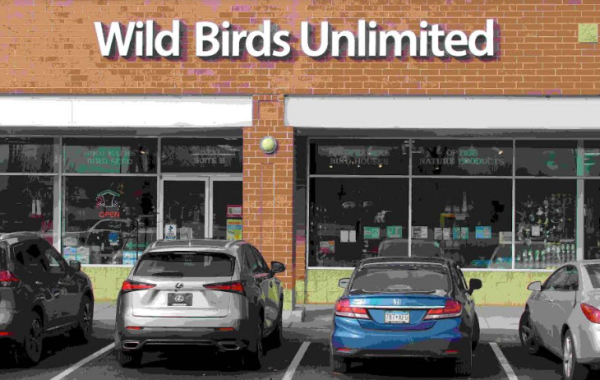 Unfortunately, I have no wild bird stores in my rural neighborhood, so I wanted to stop into a couple Minneapolis-area stores to see what they had to offer, and to buy a couple items. I was looking for some Bark Butter, which we featured in our Gear & Products section last week, so I was happy to find and purchase a large package believing that this was going to be a popular and interesting treat for feeder birds. When I paid for the unique Bark Butter Bits I was surprised to receive a couple gifts for stopping into the Wild Birds Unlimited store – a new 2019 bird calendar and a hefty package of black oil sunflower seeds. I felt like a bandit walking out of the store with two handfuls of products – thanks again! The second wild bird store I stopped at offered a service I never imagined for an independent wild bird store, a delivery service – complete with a smartly painted delivery van. Great idea it would seem. An obvious missing element in both wild bird stores was the absence of binoculars, spotting scopes, cameras, lenses, tripods, backpacks – but I guess these were backyard feeding stores. I would have guessed that the stores would have offered at least a limited or specialized selection of these items that ALL birders use and buy. But hey, I’m not a business person; what do I know? My message for this week, and for the coming month, is for all of us birders to support our birding stores in any ways possible. Primarily, by walking in the store weekly to get small or larger items as needed, and enjoy the experience – I sure did! And don’t forget about birding-related Christmas gifts for everyone on your list. I must say that I was much more active in buying backyard birding equipment during November, and I expect it will pay off outside my bay windows during December. Time for you to gear up?